Posted on April 12, 2019 by thelostlighthouse	in Gaming, Podcast, Total Reroll and tagged 5th Edition, 5th edition D&D, actual play, crime, D&D, detective, DnD, Dungeons & Dragons, Dungeons and Dragons, gaming, Mystery, Neverwinter, pen and paper RPG, podcast, real play, role playing game, RPG, thelostlighthouse, TLL, tllgaming, tllpodcast, Total Reroll, Total Reroll Equinox, ttrpg, Wizards of the Coast. Welcome to episode 32 of Total Reroll NSCU, our Dungeons and Dragons podcast series. We are members of the Neverwinter Special Crimes Unit, brought in to investigate strange goings on in the city of Neverwinter and to uphold the law! Our captain Euness Noon has been captured by Zhentarim criminals! So are off to the village of Thundertree to go and get her back! 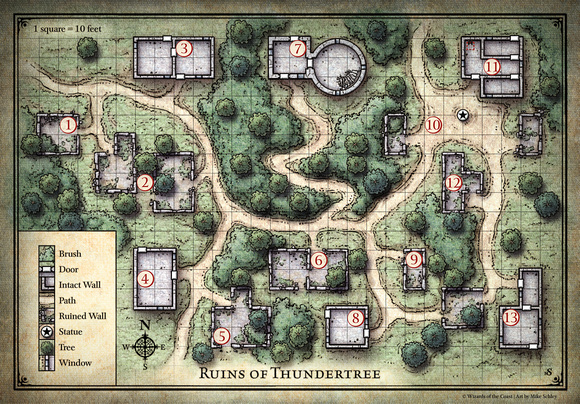 This episode mostly takes place in the village of Thundertree. We reference the map a lot, we enter from the south west (next to 5) and Euness is being held in the courtyard to the north east (10). Grim approaches up the path from 13, we talk about the bad guys arriving in the town earlier by the path in the middle of the map. New episodes are out every other week on alternate Fridays to The Weekly Rapture pop culture podcast. If you enjoy the episode, please let us know on Twitter or Facebook, give us a 5* rating on itunes, or share with anyone you think may enjoy it! Posted on March 29, 2019 by thelostlighthouse	in Gaming, Podcast, Total Reroll and tagged 5th Edition, 5th edition D&D, actual play, crime, D&D, detective, DnD, Dungeons & Dragons, Dungeons and Dragons, gaming, Mystery, Neverwinter, pen and paper RPG, podcast, real play, role playing game, RPG, thelostlighthouse, TLL, tllgaming, tllpodcast, Total Reroll, Total Reroll Equinox, Wizards of the Coast. Welcome to the episode 31 of Total Reroll NSCU, our Dungeons and Dragons podcast series. We are members of the Neverwinter Special Crimes Unit, brought in to investigate strange goings on in the city of Neverwinter and to uphold the law! We are hunting a vampire that has been kidnapping and killing dwarven women. Time to head into the sewers to find him! Posted on March 15, 2019 by thelostlighthouse	in Gaming, Podcast, Total Reroll and tagged 5th Edition, 5th edition D&D, actual play, crime, D&D, detective, DnD, Dungeons & Dragons, Dungeons and Dragons, gaming, Mystery, Neverwinter, pen and paper RPG, podcast, real play, role playing game, RPG, thelostlighthouse, TLL, tllgaming, tllpodcast, Total Reroll, Total Reroll Equinox, Wizards of the Coast. Welcome to the episode 30 of Total Reroll NSCU, our Dungeons and Dragons podcast series. We are members of the Neverwinter Special Crimes Unit, brought in to investigate strange goings on in the city of Neverwinter and to uphold the law! We are investigating the disappearance of several dwarf women, and think a vampire might be responsible! Lets see where the leads take us. Total Reroll NSCU: Episode 29 – Do Dwarves Have Blood? Posted on March 8, 2019 by thelostlighthouse	in Gaming, Podcast, Total Reroll and tagged 5th Edition, 5th edition D&D, actual play, crime, D&D, detective, DnD, Dungeons & Dragons, Dungeons and Dragons, gaming, Mystery, Neverwinter, pen and paper RPG, podcast, real play, role playing game, RPG, thelostlighthouse, TLL, tllgaming, tllpodcast, Total Reroll, Total Reroll Equinox, Wizards of the Coast. Welcome to the episode 29 of Total Reroll NSCU, our Dungeons and Dragons podcast series. We are members of the Neverwinter Special Crimes Unit, brought in to investigate strange goings on in the city of Neverwinter and to uphold the law! We just saved the city from a literal hell. Surely now we’ll get some time off? Posted on February 15, 2019 by thelostlighthouse	in Gaming, Podcast, Total Reroll and tagged 5th Edition, 5th edition D&D, actual play, crime, D&D, detective, DnD, Dungeons & Dragons, Dungeons and Dragons, gaming, Mystery, Neverwinter, pen and paper RPG, podcast, real play, role playing game, RPG, thelostlighthouse, TLL, tllgaming, tllpodcast, Total Reroll, Total Reroll Equinox, Wizards of the Coast. Welcome to the episode 28 of Total Reroll NSCU, our Dungeons and Dragons podcast series. We are members of the Neverwinter Special Crimes Unit, brought in to investigate strange goings on in the city of Neverwinter and to uphold the law! Someone just murdered a holy woman and plunged the entire city into darkness. Normal Friday then. Posted on January 25, 2019 by thelostlighthouse	in Gaming, Podcast, Total Reroll and tagged 5th Edition, 5th edition D&D, actual play, crime, D&D, detective, DnD, Dungeons & Dragons, Dungeons and Dragons, gaming, Mystery, Neverwinter, pen and paper RPG, podcast, real play, role playing game, RPG, thelostlighthouse, TLL, tllgaming, tllpodcast, Total Reroll, Total Reroll Equinox, Wizards of the Coast. Welcome to the episode 27 of Total Reroll NSCU, our Dungeons and Dragons podcast series. We are members of the Neverwinter Special Crimes Unit, brought in to investigate strange goings on in the city of Neverwinter and to uphold the law! We just busted up the drow mercenary gang Bregan D’aerthe, who years ago killed Grim’s partner. A type of justice was meted out. Now its time for some well deserved R&R (after one of us is chewed out by the Captain…). Posted on January 18, 2019 by thelostlighthouse	in Gaming, Podcast, Total Reroll and tagged 5th Edition, 5th edition D&D, actual play, crime, D&D, detective, DnD, Dungeons & Dragons, Dungeons and Dragons, gaming, Mystery, Neverwinter, pen and paper RPG, podcast, real play, role playing game, RPG, thelostlighthouse, TLL, tllgaming, tllpodcast, Total Reroll, Total Reroll Equinox, Wizards of the Coast. Welcome to the episode 26 of Total Reroll NSCU, our new Dungeons and Dragons podcast series. We are members of the Neverwinter Special Crimes Unit, brought in to investigate strange goings on in the city of Neverwinter and to uphold the law! We are in the HQ of the drow mercenaries Bregan D’aerthe, the gang who killed Grim’s partner years ago. But will he find justice? Fancy supporting the site? You can pick up all of the 5th edition D&D books from Wizards of the Coast using our Amazon links below, and we’ll g8et a cut with no extra cost to you!